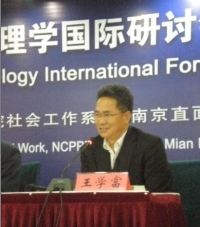 Wang Xuefu was the first psychologist I met in China in 2003 with a commitment to an indigenous psychology. It was he who introduced me to the Chinese novelist, Lu Xun, and to the notion of Zhi-mian (the courage to face the future), and I have been reading both Wang and Lu Xun ever since. Over the years, Wang has been in conversation with Western existentialism even as he has continued his work on the indigenous emphasis on Zhi-mian. At the Second International Conference on Existential Psychology in Shanghai, China, I proposed that we would do well to recognize the potential contribution of Chinese psychologies to the West. However, the issue is whether Western existential psychology wished to claim Chinese existentialism as another expression of its own commitments or if we truly wished to learn from Lu Xun or Wang Xuefu. If so, it seemed important to me that we not cast them in a Western existentialist mold. Then, there would be no room for surprise. Moreover, should we wish to export Western existentialism to China, we would need at least to ponder if our Western existentialism might have deleterious effects on Chinese culture. Wang reflects four characteristics of culturally sensitive existential psychologists, categories that have emerged as I have studied the lives of psychologists internationally: (1) a profound cultural identity, (2) a prophetic stance vis-à-vis their own culture, (3) the freedom to borrow from other cultures, and (4) at the same time to mine their own cultural tradition. Understanding Chinese culture includes examining its various pathologies and exploring its resources for healing. On the one hand, I have witnessed a lot of problems in China caused and sustained by devastating cultural factors. On the other hand, I have become aware of the abundant resources for therapy that permeate Chinese culture—its philosophy, medicine, literature, religion, and folk culture. All these can be integrated into therapy for the well-being of a people. As a therapist in China, I liken myself to a tree deeply rooted in Chinese culture absorbing nutrients and bearing fruit year after year…. 3) Openness to the West. Another response by Wang to his social environment is his openness to the West while at the same time affirming his Chinese culture as the point of departure. Wang admits that many Chinese do not understand the full meaning of the Western term “existence” but he is confident that Chinese people understand Zhi-mian. And Zhi-mian is consistent with existentialism. 4) Cultural Retrieval. Chinese culture is rich with insight into human pathological behavior and wisdom for healing available in folklore, folk customs, and from shamanic healers. From Confucius, Wang learns the importance of education, cultivation, modeling, setting up examples, teaching, guidance, care and concern, nurturing, parenting, etc., from which a kind of teaching therapy can be developed. From Taoism, he suggests that we learn about the unending pursuit of awareness, which may help address compulsiveness. Zhuang Zi can help in terms of leading people from a closed self (lost in blind desire and self-contradiction) to a larger self integrated with nature. Wang Xuefu is increasingly dissatisfied with current clinical programs. Teaching for him is a relational process, and in university programs he knows, the faculty are largely inaccessible, personally distant, and boundary conscious. Reaching back into his distant Chinese past, Wang is developing an apprentice model for lifelong learning as a healer. In an ancient Han ritual, he recently accepted five therapists as apprentices. The ritual is elaborate with scripted questions and responses given while dressed in ancient gowns. Meetings with the Master teacher are irregular and the length of meetings may be from a few hours to a month-long retreat. The Master teacher is transparent about his life, dreams, foibles, and healing. The relationship endures whether the apprentice chooses to remain or to explore other directions. The otherness of Xuefu’s model is not easily assimilable in our Western approaches. There is much here, it seems to me, that Western psychologists can learn from. Our existentialism has been characterized as individualistic; Wang’s existentialism is rooted deeply within culture. It may be that existentialists of the past (Kierkegaard, Sartre, Camus) were critical of the religious and political situation of their day but those voices seem muted. Not so with Wang Xuefu. Wang, X. (2008). Becoming a therapist in Chinese culture: A personal perspective. Presented in Seoul, Korea, February 14-18, 2008. Today’s guest contributor, Al Dueck, is the Evelyn and Frank Freed professor of the integration of psychology and theology at Fuller Graduate School of Psychology.